(1) Student loan default rate. This measure uses the average two-year default rate from the 2008-09 through 2010-11 academic years. This data comes with one substantial limitation: for some university systems, default rates are reported at the system level instead of the institutional level. In these cases, each college was assigned the reported value for the system, although this may not accurately reflect default rates. For example, Rutgers reported a 4.9 percent default rate; it’s probably the case that the branch campuses in Newark and Camden have more defaults than the main campus in New Brunswick, but that cannot be discerned in the data. Colleges received three points for an average default rate below 3 percent, two points for a rate between 3 percent and 6 percent, one point for a rate between 6 percent and 9 percent, and no points for a rate above 9 percent. Four colleges did not report default rates, and were given a score of zero points on this measure. (2) Graduation rate. This measure uses the average six-year institutional graduation rate for first-time, full-time students from 2010 through 2012. Colleges received three points for an average graduation rate above 70 percent, two points for a rate between 50 percent and 70 percent, one point for a rate between 30 percent and 50 percent, and no points for a rate below 30 percent. (3) Graduation rate performance. 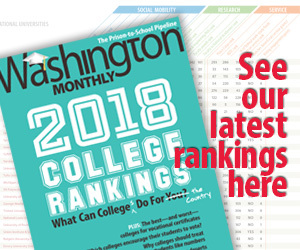 The predicted graduation rate measure is based on research by Robert Kelchen, assistant professor in the Department of Education Leadership, Management and Policy at Seton Hall University and methodologist for the annual college guide, and Douglas N. Harris, associate professor at Tulane University. The graduation rate prediction formula uses data from 2010 to 2012 and includes the percentage of Pell Grant recipients and students receiving student loans, the average ACT/SAT score, the admit rate, the racial/ethnic and gender makeup of the student body, the number of students (overall and full-time), and institutional characteristics such as whether a college is primarily residential. We estimated this predicted graduation rate measure in a regression model separately by degree classification (research, master’s, baccalaureate, and liberal arts), imputing for missing data when necessary. Schools with graduation rates that are higher than the “average” school with similar stats score better than schools that match or, worse, undershoot the mark. Two colleges, the California Institute of Technology and Harvey Mudd College, had predicted graduation rates of just over 100 percent. We adjusted these predicted graduation rates to 100 percent. Colleges received three points if they outperformed their predicted graduation rate by at least 5 percent, two points if they outperformed by less than 5 percent, one point if they underperformed by less than 5 percent, and no points if they underperformed by more than 5 percent. (4) Percent Pell Grant students. This measure uses the percentage of undergraduates receiving Pell Grants in the 2009-10 through 2011-12 academic years as a proxy for a college’s effort in serving a socioeconomically diverse population. Colleges received three points for having at least 50 percent of students receiving Pell Grants, two points for between 35 percent and 50 percent Pell, one point for between 20 percent and 35 percent Pell, and no points for being less than 20 percent Pell. (5) Net price of attendance. This measure reflects the average price for the 2009-10 through 2011-12 academic years (tuition, fees, room and board, and other expenses minus any grant aid received) that students receiving any grant aid from the institution, state, and/or federal government should expect to pay for college. (This does not include students who do not receive any grant aid, but it’s arguable that we don’t care as much about the prices these students pay since they are primarily from higher income families.) Colleges received three points for a net price under ï™“10,000, two points for a net price between ï™“10,000 and ï™“15,000, one point for a net price between ï™“15,000 and ï™“20,000, and no points for a net price above ï™“20,000. Scoring system. Colleges received a score from zero to fifteen points by adding together their scores on all five of the above measures. Colleges that received the same score are ranked by the net price of attendance. —Eds.